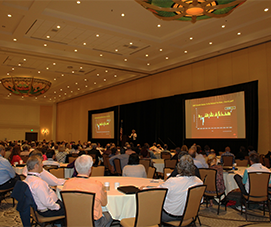 May 10, 2018 – Hampton, N.H. – SIAA’s (Strategic Insurance Agency Alliance) 45th Business Meeting brought over 300 insurance professionals to the Gaylord Palms Resort & Convention Center in Kissimmee, Florida last week. Over 20 top insurance carriers and 49 regional master agencies came together to exchange ideas, information, and opportunities over the course of three days. Joan K. Woodward, President of the Travelers Institute and Executive Vice President of Public Policy for Travelers Insurance was guest speaker on the final day of the event. SIAA is the largest national alliance of independent insurance agencies in the country. Its master agencies have signed over 6,750 independent agency members, writing more than $7.41 billion of total in-force premium. According to Masiello, independent agency members succeed because SIAA provides access to companies, resources, and services they otherwise could not utilize. SIAA is a national alliance of over 6,750 signed independent insurance agency members generating hundreds of millions in new premium business annually. SIAA is dedicated to the creation, retention and growth of the independent insurance agency distribution system.